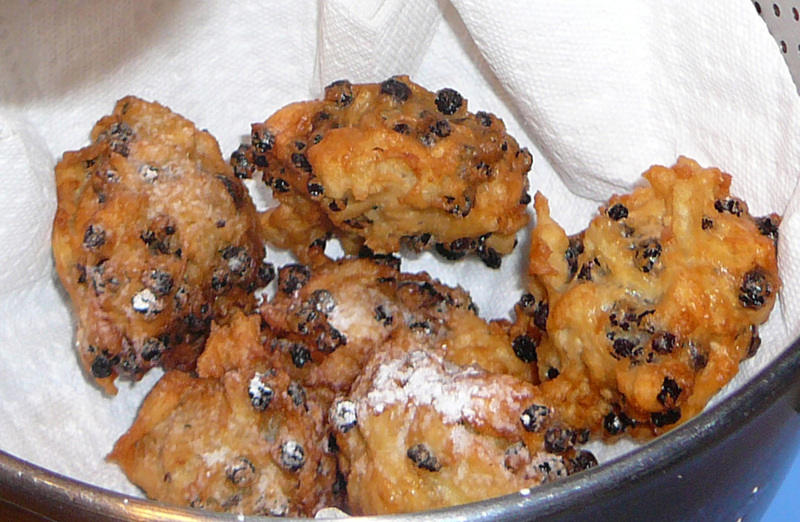 Well, I'll be showing my roots, but every New Year's Eve, I have always had Olliebollen. Lately, I make it, just like my mother still does and her mother before her and so on. We're Dutch. We ring in the new year by eating these deep-fried beauties. Heat enough vegetable oil to 375 degrees F to deep fry these olliebollen. (I use my electric wok set on high with about 1 1/2 inches of oil in it.) Drop the batter by tablespoon into the hot oil. I try to cook about 6 or 7 at a time, but by staggering their entry into the oil by 30 seconds or so, the first one will be done when the last one has been in a bit. This way the oil doesn't cool too much and you don't have to rush to get any in or out "on time". Fry about 4 minutes on each side. They should come out lightly brown all over. In the picture above, the bottom 3 have been flipped already. When they are that color all over, they are done. Remove to a paper towel-lined colander and sprinkle with icing sugar. Go ahead, try one! Good luck stopping at just one! These are fantastic when served warm, but they're still great even when they've cooled off. Enjoy! These look great! I agree, you can't stop at just one! Happy New Year!